Undeniably stylish and modern, this contemporary sofa sectional is the decorating solution that you've been looking for. Sleek, clean lines and exposed block wood feet are characteristic of the contemporary style. High quality cushioned seat and back is ergonomically designed to bring you superior comfort and relaxation. Decorative square tufting on track arms and cushions, and exposed stitching provide that unique, urban touch for a living room that is sure to impress family and friends. The Barrett Contemporary Sofa Sectional with Track Arm and Cushion Tufting by Palliser at Al-Mart Furniture in the Oak Park, River Forest, Chicago, Elmwood Park, Forest Park, River Grove, Maywood, Melrose Park, Berwyn, Cicero, North Riverside, Brookfield, Lagrange Park, Franklin Park, Norridge, Oakbrook, Elmhurst, Bensenville, Lyons, Stickney, Harwood Heights, IL area. Product availability may vary. Contact us for the most current availability on this product. 77558-15 RHF Chaise 1 32" 59" 33"
77558-39 LHF Sofa Split 1 96" 38" 33"
77558-14 Armless Loveseat 1 52" 38" 33"
Furnish your living room with an updated look that will truly satisfy your eye for style and impress family and friends. The Barrett living room collection is the perfect solution. 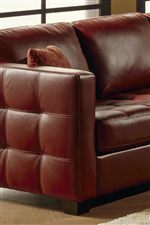 Leather upholstered stationary sofa and arm chair features decorative square tufting on track arms and seat cushions for a look that is unique and inviting. 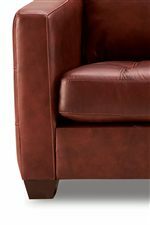 High-quality cushioned back and seat is ergonomically designed for maximum comfort and durable support. Solid block wood feet and decorative stitching finish off the Barrett collection for a chic, and sophisticated living room experience. The Barrett collection is a great option if you are looking for Contemporary furniture in the Oak Park, River Forest, Chicago, Elmwood Park, Forest Park, River Grove, Maywood, Melrose Park, Berwyn, Cicero, North Riverside, Brookfield, Lagrange Park, Franklin Park, Norridge, Oakbrook, Elmhurst, Bensenville, Lyons, Stickney, Harwood Heights, IL area. Browse other items in the Barrett collection from Al-Mart Furniture in the Oak Park, River Forest, Chicago, Elmwood Park, Forest Park, River Grove, Maywood, Melrose Park, Berwyn, Cicero, North Riverside, Brookfield, Lagrange Park, Franklin Park, Norridge, Oakbrook, Elmhurst, Bensenville, Lyons, Stickney, Harwood Heights, IL area.